The financial services industry has traditionally been a decidedly unsexy one, lacking the trendy trappings of the tech world. Massively hyped concert-like product announcements, hip conferences replete with famous musical headliners, open offices, beer on draft, and so-called unicorn companies have all been the domain of the tech industry. Want to learn more about financial technology? Discover the best financial services software in 2019. While some of those things will remain exclusive to that world, there is no doubt that the financial services industry has become flush with a vitality that has accompanied significant technological change. That change has become apparent during the past few years, particularly with the injection of blockchain into the mainstream consciousness. While Bitcoin and the rest of its cryptocurrency cohorts have dominated the headlines and inspired millions of words in digital and physical ink, there are a host of fintech applications and industry subsections that have remained outside the spotlight. Those applications will see increased adoption over the next few years and solidify the notion that fintech is here to stay. Fintech is transforming the financial services industry, and will continue to do so as the industry makes the shift to fostering innovation. 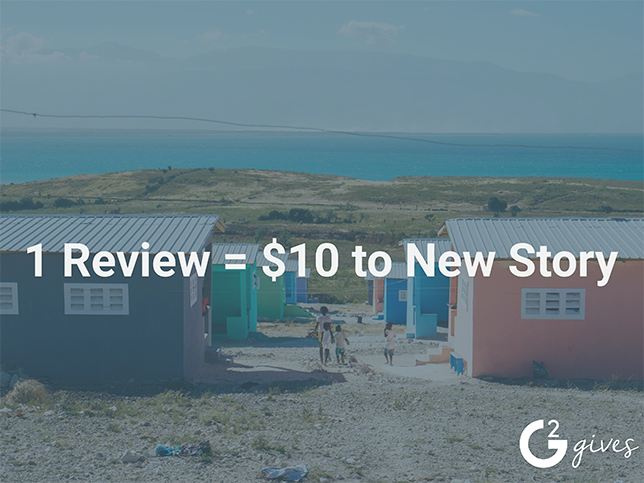 Fintech products improve the ease with which people can make cross border remittances, increase the number of data points used to make loan decisions, automate regulatory functions, and more. The breadth of fintech project types has expanded greatly over the past few years, with innovation in multiple fintech subcategories driving adoption in sectors such as insurance and regulation. Insurance technology, a branch of fintech, has seen machine learning applications automate internal processes and claim processing. An increase in connected devices and the means to process that data is driving the creation of personalized insurance products based on an individual’s data sets. Regulatory technology has seen know your customer (KYC) and anti-money laundering software infused with artificial intelligence pop up in the past couple of years. These solutions, along with those dealing with compliance, risk management, transaction monitoring, and regulatory reporting, will continue to develop as more and more is sunk into their creation and adoption. Fintech investment, innovation, and adoption will continue to grow rapidly in the next few years as companies start to see significant return on investment (ROI) from fintech investments. Prediction: Robotic Process Automation (RPA) software will be widely used in 75% of financial services institutions by the end of 2019. RPA refers to robotic process automation software programs that automate repetitive human processes by utilizing the exact same application interface a human would, eliminating built-in human inefficiencies. For example, a robot might carry out a data entry task utilizing Microsoft Excel and the company CRM software. The robot would use the exact same applications to get the task done, but would finish much more quickly, its speed being limited only by the speed of the various applications it would use. The financial services industry in particular contains a large amount of roles built around data entry and repetitive tasks. Robots, provided they are trained properly, can take care of these tasks for any department. Robots cost around $15K annually per unit, with an initial implementation cost of $40K–$50K per robot. That’s a lot of money in start-up costs, but companies typically see 40–100% ROI within 3–8 months. The annual cost of running a robot to help with automation is nothing compared the cost of paying someone to do the same tasks much less efficiently. Robotic process automation can and will help financial services institutions increase efficiency and eliminate wasted time, particularly when it comes to tedious, easily repeatable tasks. As of the end of 2017, 11% of financial services institutions viewed themselves as having adopted RPA widely across their organization. 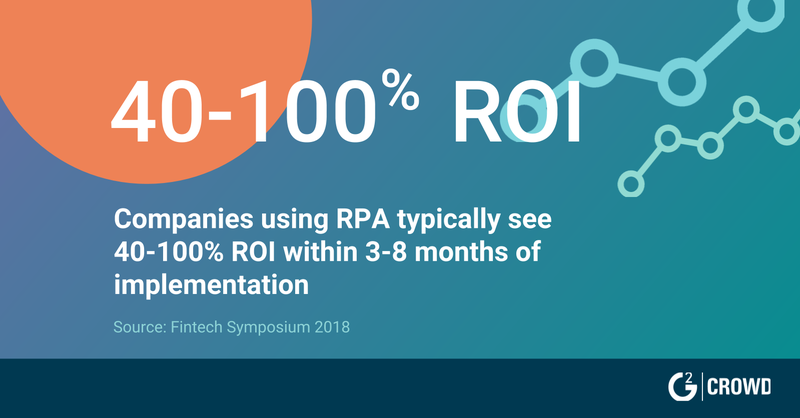 The improvements seen in robots as well as an improvement in the knowledge about RPA and its potential use cases will drive an upswing in adoption and deployment in 2019, and continue over the next few years. The worldwide mobile banking and payments industry is massive, processing over a billion dollars per day in 2017. Latin America and sub-Saharan Africa in particular have seen widespread adoption of mobile payments because of financial exclusion. Financial exclusion refers to situations in which financial services (banking, payments, etc.) are not available. This often occurs in more economically disadvantaged areas, or areas that traditional financial services institutions have deemed not worth the investment. Barriers to entry put up by traditional brick-and-mortar banks have catalyzed the development and widespread use of mobile banking as both a primary and exclusive method of financial management. The proof of identification and funds that traditional bank applications require bar some from qualifying for an account, while distance to a brick-and-mortar location (experienced by those in rural areas) is a barrier for others. Mobile payments allow them to gain some degree of financial inclusion without meeting the standards typically set by traditional financial institutions. Mobile banking can be far more accessible than traditional banks, and smartphone adoption is driving that accessibility. Anyone with a smartphone and internet access can become a part of the financial system without the need to open a traditional bank account. 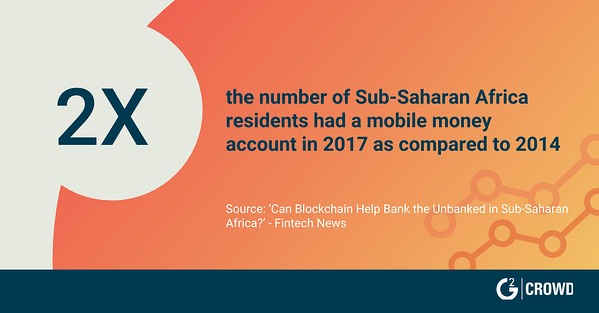 In sub-Saharan Africa, one of the regions with the most potential for mobile money use, 21% of residents currently had a mobile money account in 2017, double the number that did in 2014. If the past is any indication, the mobile money market will continue to grow at an astonishing rate in the region, as well as in other regions with low financial inclusion but relatively widespread internet access and smartphone use. Mobile banking will continue to grow rapidly, particularly in areas currently reliant on the technology. In addition, blockchain will tie itself into the industry and become an integral part of fintech within the mobile banking industry. Blockchain technology will provide an immutable record of personal data for individuals looking to use mobile payment solutions, giving the industry an added layer of security. The security inherent in these blockchain solutions will prevent fraud and improve the ability for people to become part of the financial system. Another development that will support mobile payments adoption is the development and deployment of 5G technology. For mobile banking to become ubiquitous, the development of 5G technology is paramount. 5G tech reduces latency and transaction times, which is key to ensuring the network can handle the amount of transactions at scale. PSD2 is a European Union regulatory directive designed to increase competition within the European payments industry, solicit participation in the industry from non-banks, and protect payment solution users. While PSD2 is a European directive, the concept of open banking has spread internationally and will drive financial product development. Enhancing consumer protection and a desire to create legitimate competition is healthy for the banking industry, and will drive innovation in the financial services sector, specifically in the banking sector. Open banking, while perhaps far from being codified and mandated in the U.S., is here to stay. Open banking refers to banks being forced to release their data sets in a secure and standardized manner. This data can include everything from bank locations to customer transaction records. The ultimate goal is to allow third parties (or the tech division within a bank) to utilize that data to create products. To stay ahead of the curve and reap some of the benefits of that innovation, banks will actively engage in supporting fintech application development by giving more access to their data than explicitly stated in PSD2 or any other directive that comes from the regulatory bodies. By actively promoting open banking innovation and forging fintech partnerships with companies using their data sets, banks will be able to enhance their existing products and leverage innovative fintech products being created with their data. In this way, banks can exert some degree of control over how their data is being used and ideally (for them, if not for the market) get something out of it. This will be prompted by the regulatory difficulties experienced by both fintech and traditional financial institutions and the need for high-level buy-in to get widespread adoption. Fintech has, until now, been viewed by the financial services industry as a potential disruptor. This is due in part to the shadow of revolution that blockchain and the cryptocurrency hype cast over the entire industry. Fair or not, fintech and cryptocurrency were entwined in the public eye. Now, however, particularly in the financial services industry, there is a greater degree of understanding of the technology. The industry saw fintech as potentially operating outside the realm of regulation, which is the initial intention of cryptocurrencies. However, crypto is a small subset of the potential uses housed under the fintech umbrella. Additional applications labeled as fintech include regulatory technology (regtech), insurance technology (insurtech), and smart contracts. Fintech companies will still disrupt the industry, but not revolutionize it as previously thought because of the wall of regulation they have run into. While powerful regulatory bodies have yet to pass specific directives regarding the rules that govern fintech, they have engaged in multiple enforcement actions against fintech companies. In addition, the Office of the Comptroller of the Currency (OCC) recently created and released the Fintech Charter. In it, the agency lays down relatively ambiguous guidelines for fintech companies that indicate their desire to shackle them to existing financial services regulations. Instead of revolutionizing, fintech companies will contribute to the evolution of the financial services industry. To have the desired degree of impact, particularly in the banking industry, fintech companies will partner with traditional financial services institutions. The institutions themselves will likely be the drivers of these partnerships, as they have more to gain from leveraging new technology and the resources to sink into promising projects without risking many resources. One prime example of a successful partnership is that of CurrencyCloud and Monese, a mobile-only UK based bank. Monese needed the ability to have customers make international transactions, but there was a ton of regulatory hurdles that needed to be cleared for that to happen. They ended up partnering with CurrencyCloud, a fintech that gave them access to their API, allowed them to bypass those hurdles, reduce forex costs, and reduce payment costs as well. These partnerships, while currently more popular for community banks, will be seen at a larger scale in 2019 and over the next few years. Real estate is an industry riddled with inefficiencies. There are huge swaths of the sector—title companies being an area that jumps immediately to mind—that will be greatly reduced and potentially eliminated by the implementation of blockchain-based smart contracts. Smart contracts remove the need for intermediaries, which clog up the real estate industry and slow down every transaction. While this is not a good thing if you happen to work in one of the areas that will be affected, it is fantastic for consumers and property owners who are able to cut out functionaries and reduce transaction costs. Want to learn more about real-estate tech? Discover the best real-estate software in 2019. Immediately upon completion of a desired and agreed upon task, the contract releases the agreed upon amount of money to the party which has completed the task. The contract, being housed on a blockchain, then creates an immutable transaction record, which contributes to anti-money laundering (AML) efforts and ensures the legitimacy of transactions that are listed on the blockchain. Blockchain software and applications outside of cryptocurrency will prove their staying power in the financial services industry, and real estate is the industry in which they’ll have the greatest impact. Commercial real estate projects are currently a murky backwater of opaque deals and mounds of indecipherable paperwork. The nature of the industry makes it a haven for money laundering activity and clogs up the flow of doing business, dragging out deals that should take much less time. Blockchain will bring an abrupt end to the lack of transparency in the industry, specifically commercial-scale projects. By the end of 2019, we will begin to see the first tokenized commercial real estate projects. What this means is that a projects will be divvied up into distributable tokens. Any exchange involving these tokens, and all transactions relevant to the project, will end up housed on the blockchain. This will create an auditable, immutable record of transactions, introducing transparency to the industry and increasing the ease with which individuals and companies are able to invest in and divest from these projects. Tokenizing projects also makes reallocation of assets easy in case of bankruptcy. The investment increase will be driven by the increasing amount of regulatory oversight with regards to fintech as well as the increasing number of regtech solutions allowing large financial institutions to implement tech instead of hiring more compliance employees. Regtech solutions address regulatory reporting, compliance checks, risk management, identity management, and transaction monitoring. The breadth and scope of solutions housed under the regtech umbrella provide financial institutions with a wide range of use cases and potential for efficiency improvement. Regulation is an inhibiting factor for entrance into the financial services market and costs established companies billions every year as they try to stay within regulations. Regtech, which allows financial services companies to ensure regulatory compliance more easily, including contributing to KYC and AML efforts, will become a staple in the financial services industry by 2020. Currently, 15% of financial institution employees work in compliance. That’s a large chunk of the financial industry’s workforce, and the catalyst is the 500% increase in regulatory changes from 2008–2016 in developed markets. Multiple large financial institutions are utilizing regtech solutions and seeing significant ROI from those solutions. 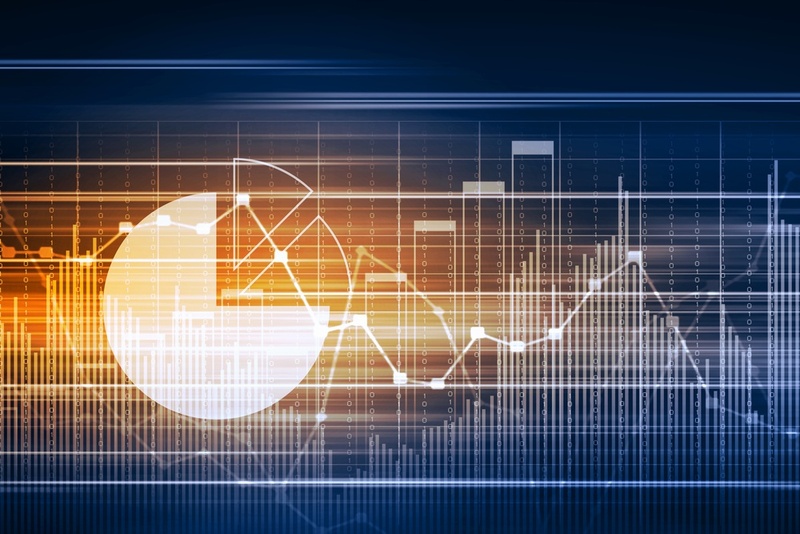 Rabobank, a large bank headquartered in the Netherlands, had its compliance team implement a risk management solution that reduced 15-minute compliance checks to three minutes. Regtech investment improves operational efficiency in compliance activities, allowing compliance departments to reduce overhead and improve performance. Regtech has proven its value for many financial institutions, and investment in this category of solutions will continue to rise. Prediction: Blockchain technology will open up opportunities for the unbanked or underbanked to gain financial inclusion. 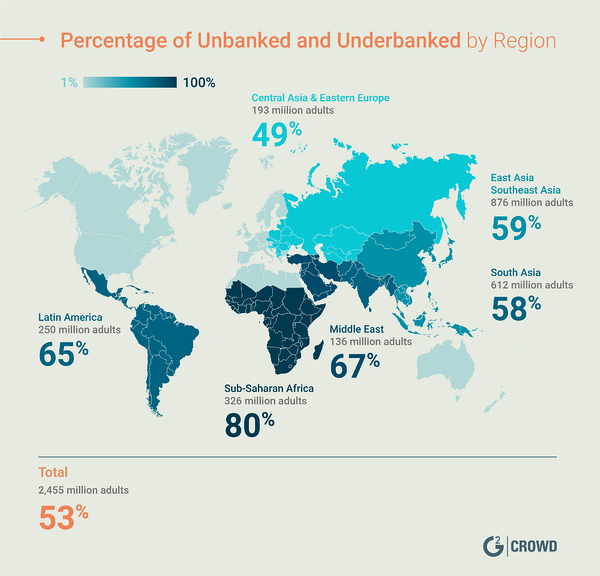 The number of unbanked will fall from 1.7 billion to under 1 billion by the end of 2020. The large swath of people who will gain financial inclusion will stem from the increased adoption of mobile banking, driven by blockchain implementation. Financial inclusion refers to individuals and businesses having access to financial products and services, such as a bank account, loans, and credit. An increase in financial inclusion means an increase in the number of people actively contributing to the transfer and movement of money around the globe, which is a positive. It also means there are more opportunities for financially included individuals and businesses to improve their situations, build and leverage credit for growth opportunities, and more. There are massive markets waiting to be tapped by fintech companies looking to expand the number of the financially included. While there may be a degree of altruism driving fintech application development geared towards increasing financial inclusion, the real motivator is the size of the market. Blockchain pushed fintech into the media spotlight, and blockchain technology will drive mobile banking adoption outside of the high growth areas in which it currently maintains the most market share. While cryptocurrency may never solidify itself as a mainstay in the markets due to its volatility and the uncertainties regarding its viability as a store of value, the underlying technology is applicable. Blockchain, by providing unbanked individuals a verifiable, easily created online identity, will allow more individuals to be financially included than ever before. Ready to learn more about trends in 2019? Discover the biggest cybersecurity trends in the coming year.